Provisions for TV, internet and telephone. Cyprus and in particular Paphos has an established reputation for diversity. The whole town of Paphos has been declared a Heritage Sight by UNESCO due to its historic ruins and yet this is a modern city that has all the amenities anyone could hope for. This golfing resort has magnificent views of one of Cyprus’ most famous sights, the Aphrodite Rock or Petra tou Romiou as it is referred to in Greek. This is a stunning coastline steeped in history and mythology and said to be the area where the goddess Aphrodite rose from the waves and stepped onto the island. This area is located between Paphos town and Limassol off the main motorway which connects the two cities. Nestled on an elevated site with commanding views of the coast and the golf greens, this resort has a lot to offer with world class facilities and an expanse of over 10 million square metres. You don’t need to be an avid golf player to love living on this estate, it also offers a luxury hotel, villas and a beach club and Spa. Paphos International Airport is only 10 minutes away, and the town of Paphos with its excellent public and private educational institutions are a mere 12 minute drive from this estate. The golfing estate is only 2 minutes away from the main freeway that joins all major cities in Cyprus. This exclusive resort is only 35 minutes away from Limassol and just over an hour away from Larnaca International Airport. All the mansions have magnificent views of the Mediterranean Sea and this massive golfing resort is set to become one of the largest luxury beachfront residential developments in Europe. 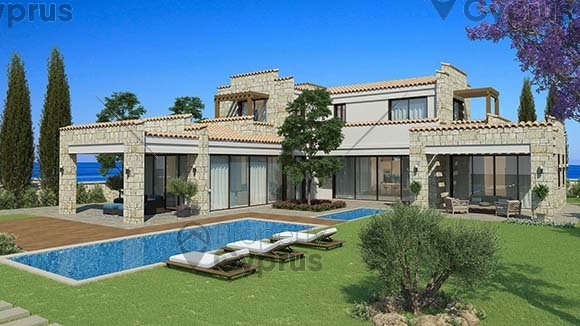 Live the Mediterranean lifestyle and enjoy your privacy in this prestigious setting which is second to none. The properties only take up 20% of the individual plots which all have private swimming pools, large terraces and landscaped gardens. These unique residences offer Mediterranean elegance with impeccable attention to detail and they offer the ultimate luxury in the most amazing locations on this estate. Each residence will enjoy a naturalistic feel with the finest materials, fixtures and fittings selected to reflect the indigenous local architecture. The latest technology will be used throughout with all modern amenities catered for. Attention to detail in every aspect of these homes is instantly noticeable with professional interior designers bringing together classic and modern designs. Harmonious, landscaped gardens complement each villa with local flora used for the ultimate outdoor experience. 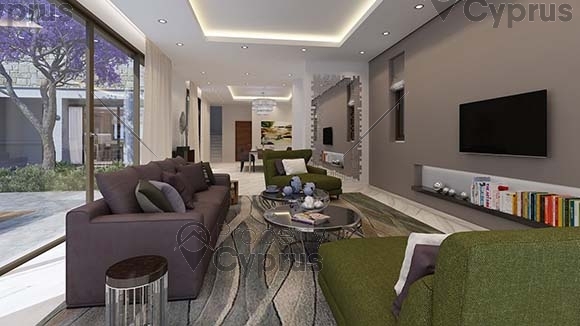 Superior construction throughout with natural marble staircase, high quality ceramic tiles, semi solid parquet in bedrooms and natural marble of high quality for basement. The kitchen will have granite worktops, high quality imported units and electric appliances. 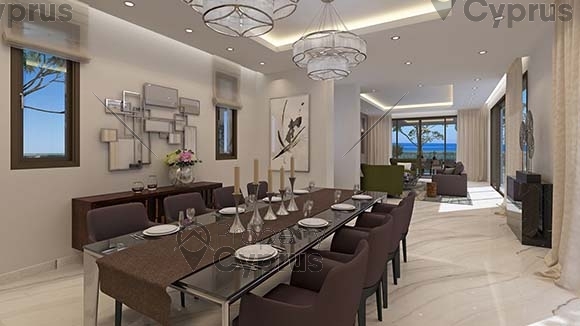 Suspended ceilings in living area and superior finishes of marble floors and walls in the bathrooms all add to the ultimate luxurious finishes of these mansions. Aluminum patio doors with thermal insulation and a provision for fly screens are also included. All rooms will be fitted with provisions for TV, internet and telephone. An audio-video entry gate system for security and automatic garage doors for private parking will be installed. All light fittings and a security system will be supplied. The outside comes complete with infinity pool, pathways, patios and garden walls in a beautifully landscaped garden. Good quality furniture for the whole house will be supplied by the vendor. In total there will be 16 luxurious homes of this stature on the resort.